At Gerry McVeigh Cars we run a different type of business. 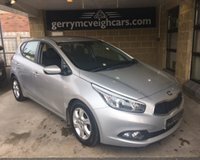 At our purpose built premises in Dungannon we don't have a showroom full of immaculately prepared cars and commission-driven sales people. You get to view the original end-of-contract vehicle as we purchased it. When you purchase the car it will then be prepared for you. The car will be serviced and valeted and any blemishes on the bodywork and interior will be addressed. We will Tax and MOT your car if necessary and if you have a Cherished Number we will transfer it for you. Your car will probably be the second largest purchase you will make so it makes sense to purchase from someone who will give you the back up you deserve. At Gerry McVeigh Cars we have fully qualified motor technicians and staff who are ready to help and advise you at every stage of vehicle ownership. Can't find the perfect car? We'll find it for you! Main dealer level servicing at a fraction of the cost. Both Interim and Full Services undertaken for all vehicles. ​At Gerry McVeigh cars we service all types of cars. We have our own team of in house technicians and full diagnostic equipment for most vehicles.